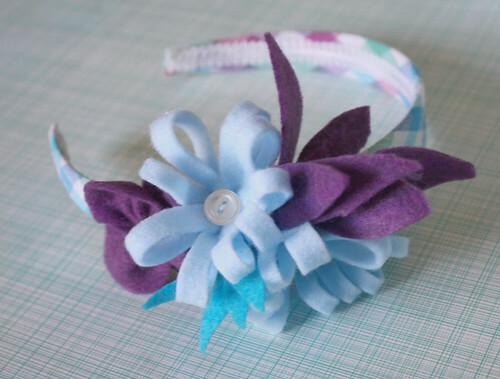 Win One of My Felt Flower Headbands! Head on over to the Dress Up Drawer Today for a chance to win all sorts of things, including one of my felt flower headbands! My headband is #5 on today’s list. PS: One of my blog friends is having a Contest too with a fab prize! Simply upload as many pics into her new Flickr group, Giving Vintage New Life, as you can of vintage things you have made into something new. It’s a great new group that will give lots of inspiration for sure! I would get the Princess headband for my little Princess (granddaughter, Logan). I love it! My daughters are 11 and 14, but the youngest loves every flower out there! She wears them every day on clips. Do you have a tutorial to make the “loopy ” flower you make ? I wonder if I can make one with sparkly fabric, bot not sure if it will fray. I would love to see you come up with something with tulle, or something fancy for teenagers, my 14 will soon be 15 and I want to make her a really fancy one for that day. Traditionally we would have a “quinceanera” but that can be really costly and big, so we will give her a princess for a day full of her favorite things, and I just know that any hair stuff you come up with would be faburrific!! Super cute! 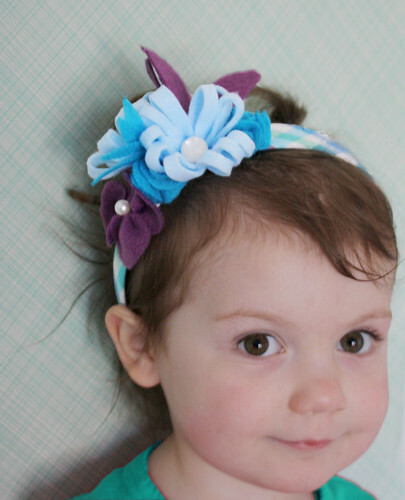 I have two little princesses at home who would have some serious girl fights over this adorable headband!! : ) I’m a follower. Jessica, she’s so, so, SO gorgeous! These are precious ! Thanks for the link to the tutorial. I want to try this one too !